Chandigarh, 16 February, 2017: British Paints, which traces its origins back to 1919,feels proud to bring to you their latest offering – “ExpaCool Premium Exterior Emulsion”. Expa Cool is a 100% acrylic high built exterior paint made to international standards that keeps exteriors looking bright and new for many years. Expa Cool is a high performance architectural coating for all types of construction residential building, offices and commercial complexes. Expa Cool is a 100% pure acrylic emulsion, with tough adhesion and flexibility, its lightfast chemical resisting pigments and other special additives, provides protection against alkali, U.V. degradation, fungal and algae growth. The product safeguards the exterior surface from the extremities of Indian weather and performs exceptionally well to withstand the test of time. It offers excellent resistance to chalking&cracking in comparison to other paints. During development, the product was exhaustively tested in some of the harsh environments of the country, where the product performance in terms of toughness, UV resistance, water resistance and anti - microbial performance was found to be outstanding. The color retention feature resists color fading from ultra violet rays. Not only this, ExpaCool Premium Exterior Emulsion has low VOC i.e. does not emit air polluting harmful vapours and paint odour that pollutes our environment & hence environment friendly. Also the product is duly certified for its Cool Roof technology and has received certification from Centre for Environmental Planning and Technology (CEPT), Ahmedabad. 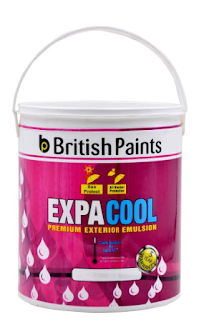 In the quest to meet up the expectation of the customers, Expa Cool Premium Exterior Emulsiongives assurance of performance upto 5 year.This also helps the customer to avoid the hassle of re-painting & save cost. Most leading paint dealers & especially British Paints Color menu counters. British Paints advent in India dates back to 1947, though its genesis was in 1919 in Britain. As a Paint manufacturer the brand has gained huge popularity in India owing to its wide and vivid range of industrial and architectural coatings. Headquartered in Delhi, the brand has been serving varied project verticals both in the industrial and retail sectors. With 50 branch offices and over 12,000 channel partners spread over the length and breadth of the country. Today British paints offers more than 50 products spread across over 9 categories such as Interior Emulsion, Exterior Emulsion, Texture Paints, Wood Finish, Undercoats, Waterproofing etc. to name a few. The brand has a solution to all home surface problems and industrial requirements. The products are manufactured at dedicated units located in Uttar Pradesh and Jammu & Kashmir. The products from the brand are certified by approving authorities such as Griha, IGBC (Indian Green Building Council), National Test House, and others. Backed by a dedicated team of professionals with rich and valued experience, the brand brings to its customer top notch coating solutions. Essentially, quality products combined with expert solutions has helped make British Paints, the most preferred brand in the Paint Industry.